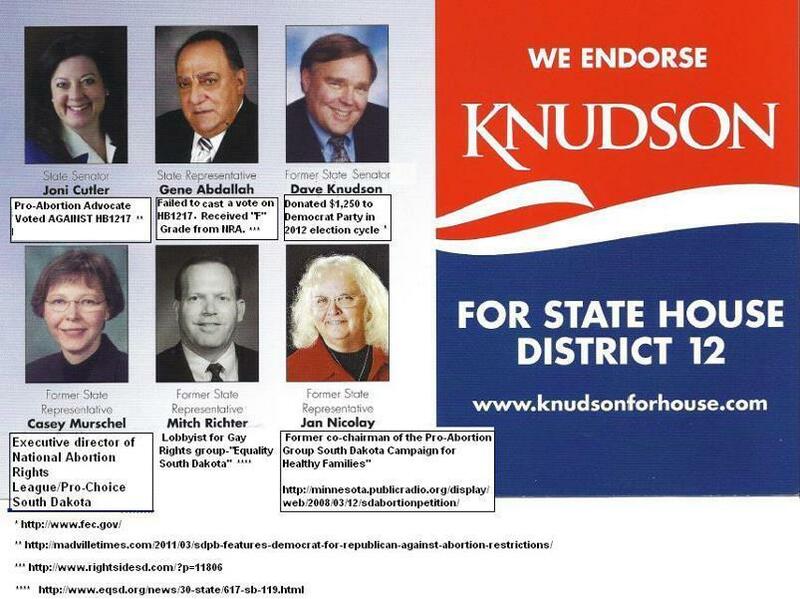 As many of you are aware, a postcard was mailed out yesterday to the voters of District 12 which included endorsements of a liberal, pro-abortion, pro-tax Democrat by half a dozen individual identified on the postcard as “Republicans”. The fact that there are two incumbent Republican legislators running for re-election who are arguably more conservative than this Democrat candidate seems to be of little concern to them. But while voter registrations may actually list these Democrat-endorsers as Republicans, past voting records against Pro-2nd amendment and Pro-Life legislation, as well as their work on behalf of organizations like the pro-abortion group NARAL and “Equality South Dakota” are enough to cause most grass-roots Republicans to question the legitimacy of their “Republican” claims. Sadly, this is not the first time that conservative candidates have come under attack from fellow Republicans. As you may recall, the governor made several ill-fated endorsements in the Republican primaries and promptly saw 3 out of the 5 less-than-conservative candidates he endorsed go down to defeat. In fact, two of the legislators he endorsed had verifiable records of voting against Pro-Life legislation and advocating for special legal treatment for “alternative lifestyles”. The governor also used the bully pulpit of his campaign e-mail account to call for investigations by Attorney General Jackley into calls placed by veterans who dared call attention to the less-than-stellar voting records of some top GOP leaders on veteran’s issues. # 1 – Did the Governor, SD GOP Chairman Tim Rave, or executive director Tony Post have advance knowledge of this postcard prior to it being mailed ? If so, why did they not bother to lift a single finger to stop it from being sent ? How deep is their involvement in this war against conservative Republicans ? # 2 – Did the Governor, Chairman Rave, or any other high-ranking members of the state GOP contribute money to help finance the design, printing, and distribution of this revolting RINO campaign mailer ? # 3 – Will the Governor denounce this postcard in the same manner in which he denounced the person (or persons) responsible for publicizing the voting records of members of the Republican leadership ? Or will he continue on with his disgusting double-standard of supporting only the most liberal and “progressive” members of the Republican Party while vilifying and chastising the more conservative members of his party who are calling for a return to the Republican values expressed in the SDGOP Party Platform ? « How did YOUR legislators vote on the issues that are important to you ?